getcalc.com's Resistor Color Code Calculator is an online electrical engineering tool to calculate or decode resistance value based on the 4 color bands of resistors. Based on the composition of the material, the resistance value get changed largely. The below table of information shows the common materials and their corresponding resistance values used in the field of electrical & electronics engineering for various purposes. Any value of resistors can be represented by using this most reliable color coding method. Users may refer the below table to get familiar with the values of different colors used in the resistors and decode the actual resistor value by applying the values in the below formula. ”Black Brown ROY of Great Britain had a Very Good Wife who wore Gold and Silver Necklace“. Each marked alphabets & words in the sentence denotes the order of colors with their associated multiplier values. User may refer the below color band table & formula for more clarification. Resistor Color Code is a popular technique used in electrical & electronic engineering to measure or decode the actual resistance value of a resistor in ohms, kilo-ohms, mega-ohms & giga-ohms. The 4 band color code is the most common & reliable color coding method to find the resistance value of a lead resistor. 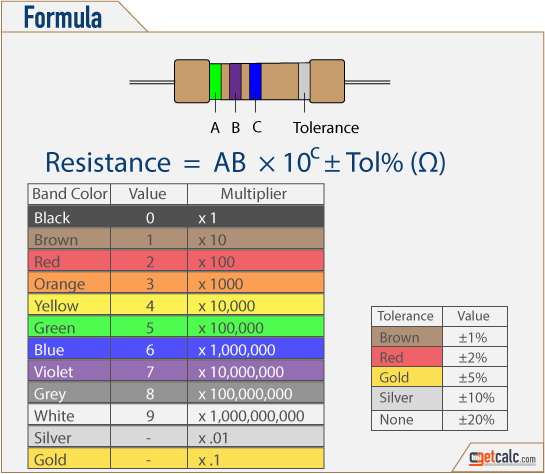 The A, B, C & Tolerance are the 4 color bands which represents the actual value of a resistor. How to Decode Resistor Color Code? The below example may help users to know how to calculate or decode the resistance value by using the color code of a resistor. Find the resistivity of a resistor having the color bands A as Green, B as Violet, C as Blue and Tolerance as Silver.